What is the difference between mild, medium and robust olive oils? Mild, medium, and robust classifications refer to both taste intensity and polyphenol count of the olive oil, usually attributed to Varietal olive oils. The more robust the oil, the higher its polyphenol count and the more peppery it tastes! Our tasting bar setting allows you to taste before buying, so you will be sure to get something you enjoy. Mild, medium and robust oils can be used interchangeably, however some people find that the milder olive oils are better suited to salads, whereas the more robust are better suited to bread dipping and cooking. Also, the higher the polyphenol count, the higher the smoke point, so if you’re planning to use your olive oil primarily for cooking, we suggest using a more robust olive oil. What is the shelf life of olive oil and balsamic vinegar? Olive oil has a fairly short shelf life, in terms of maximum taste and health benefits, which is approximately 12 to 14 months from the oil’s crush date. To stay easily within that range, we suggest that you purchase your olive oil in a quantity you can consume within six months. This ensures that you will be using the oils when the polyphenols are at their healthful peak. Balsamic vinegar has a much longer shelf life, so you don’t need to be as concerned about using it up as quickly. Our dark balsamic vinegars are aged between 12 and 18 years, and the white balsamic vinegars are aged approximately 6 to 8. So, these should be good in your cupboard for at least two years. How should I store my olive oils and balsamic vinegars? The best place to store your olive oil is a cool, dark place such as a pantry or cabinet. Avoid places that are close to a heat source such as the stove or oven. Our bottles are made of dark glass in order to protect their contents from light, but if you keep the bottles on your kitchen counter, avoid placing them in direct sunlight. You may have heard that you should store your olive oil in the fridge. You can do this, but it doesn’t help to prolong it’s shelf life. If you decide to do this, the oil will become cloudy, but will regain its clear properties when it returns to room temperature. 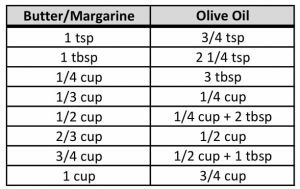 How do I substitute olive oil for butter in baking? Olive oil is a delicious and healthy alternative to butter in cooking and baking. Use the conversion chart below! We also have an incredible dairy-free Butter Infused EVOO, if you want to switch to olive oil but keep the butter flavour! Due to the high amount of polyphenols (antioxidants), the smoke points of our extra-virgin olive oils are much higher than olive oils commonly found in supermarkets. Using your oils on a stovetop, or with oven temperatures up to 400F won’t be an issue. For even higher heat, try using a Robust Varietal, Sesame Oil or Avocado Oil. What ratio of oil to vinegar should I use? If you are combining olive oil and balsamic vinegar together (such as for a salad dressing or for bread dipping), the general ratio we recommend is 2 oil : 1 vinegar. Since balsamic vinegar has a stronger taste than olive oil, you might find you don’t need as much to balance out the flavours. However, there is no wrong way to use our product! Experiment and find what works best for you. What is your Customer Loyalty Program? After purchasing 2 litres of oil or vinegar in any combination, we say “thanks!” by offering you a free 200ml bottle of any of our EVOO’s or balsamics (excluding specialty oils). There’s no card for you to carry – our system keeps track! Feel free to ask us anytime for your point balance. Effective January 1, 2020 – We ask that in order to keep your loyalty points active, you make a purchase of an oil or vinegar product at least once a year. If you have not made a purchase by the end of each calendar year, your points will reset to zero, but your customer account will remain active. What is your Bottle Return Program? Bring us your empty 200ml, 375ml or 750ml Frescolio bottles for a $0.75 per bottle credit towards your next purchase. We’ll sanitize and wash the bottles in our commercial dishwasher and re-use them in the store. Since you are able to taste our products before making your purchase, we do not accept returns or exchanges. Sorry about that!